I love chairs….all kinds of chairs. Big, overstuffed chubby chairs that can fit two people…well maybe before a big dinner! 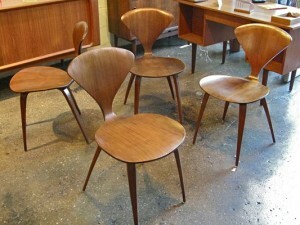 How about stand-alone side chairs that look like they used to be part of a big family back in the day? Chairs are one of the most ancient of all furniture types. We see examples of chairs today that harken back to early Egyptian, Roman and Greek civilizations. 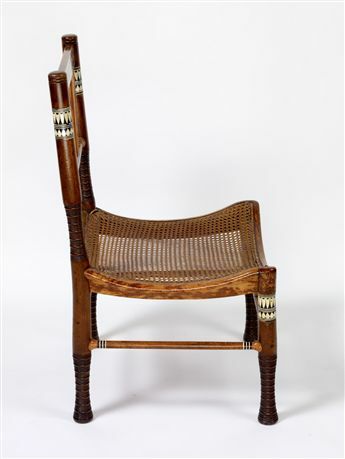 Many chairs from these early societies used wood, ivory and metal for sturdiness. Folding or X frame chairs have been found in tombs and often carved with animal forms and covered with whole skins. Actually, it wasn’t until the 16th century that we began to see a chair…one with a seat, a back and four legs….become more commonplace rather than a bench, stool or chest. With the advent of new technology and materials, chairs began to take various forms throughout the last four centuries. Today, ergonomics (comfort level) is a top consideration in how a chair is built. 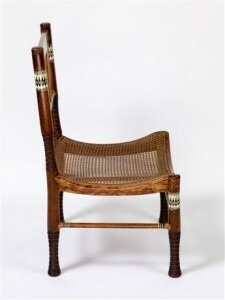 France can probably be credited with producing the earliest comfortable chairs and the largest variety. Swap meets, antique and junk shops and even people’s cast offs can be retooled to become a fabulous new addition in your home. We have taken chairs that seemed to be at the end of their days and given them new life time and time again. Today, you can spend the King’s Ransom on chairs or pick up something fantastic at Pottery Barn or even Ikea. 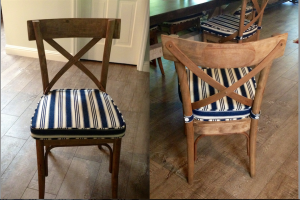 Case in point: below you’ll see an example of a fabulous chair…eight of them to be exact…..that we purchased for a client on sale at Cost Plus World Market. They are paired with a gorgeous zinc topped farm table (not shown) for their Great Room eating area. 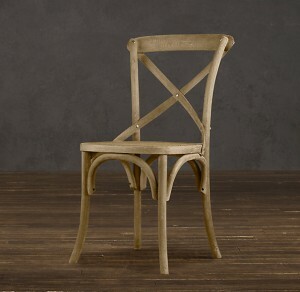 These vintage-inspired light walnut finish French bistro side chair look pretty close to ones you’d find in a Parisian patisserie. The wood is distressed, the back splat has a terrific X detail and the bottom has a wide, flat seat. Now in this case, the wood isn’t smooth so if you’re hanging out in your Lululemon leggings, you won’t find sliding to be that easy. 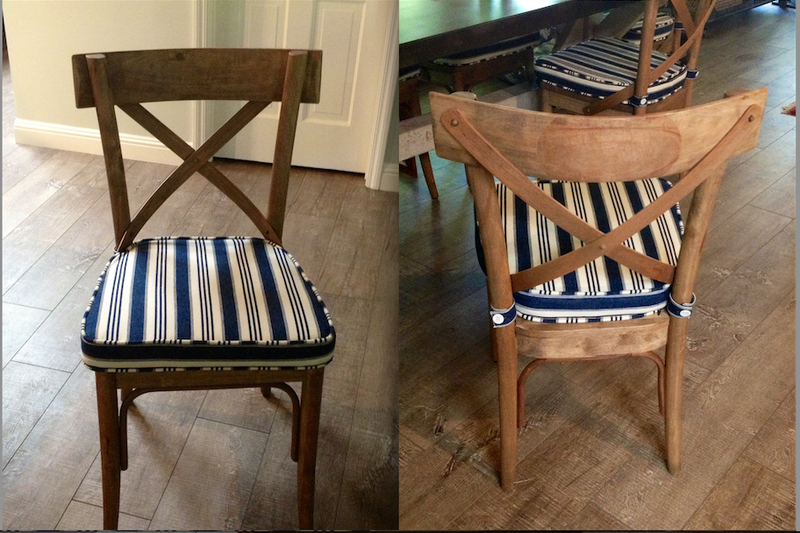 To rectify that scenario, we had custom seat cushions made in a stripe that we’ve used in another part of the house. No unsightly ties hanging down the back of the legs for these chairs. Instead, we had a small tab created and a white pearl button made them more elegant. We had each cover made with a zipper so they could be removed for cleaning. 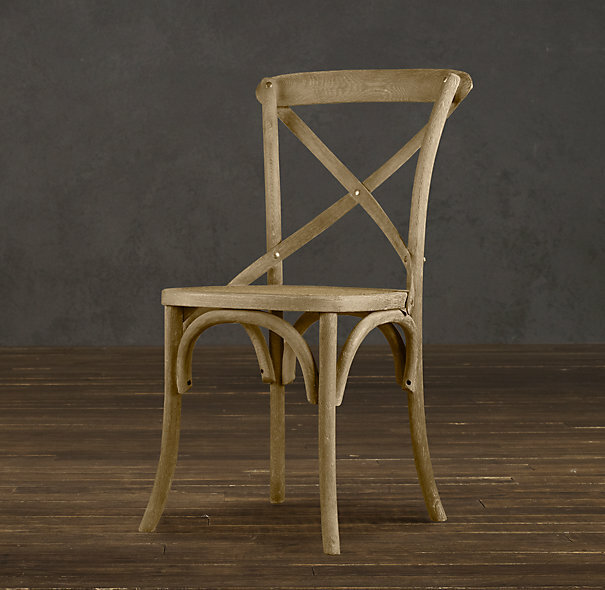 Just for comparison sake, here is Restoration Hardware’s rendition of the popular European café chair which they offer in five different finishes. On sale (today), it happens today to be similarly priced to the one we selected from CPWM with arguably the same level of workmanship. When it comes to chairs, whether they will be used daily or occasionaly, my rule of thumb is that the inhabitant’s rear must try the seat. This is really the only good way to select a chair or a couch for that matter. Each client has his or her own set of proclivities when it comes to comfort and style. So if you are purchasing fresh, then you must carve out the time in your schedule to go around and see what is comfortable for you. Then, we can either purchase chairs from a store, order from one of my sources or have it custom made. All are great options dictated by time, budget and availability. Here are some great seats I’ve seen in my searches for the next great chair. What’s the favorite chair in your home, garden or office? Send us a picture and tell us a little about it. We always love a good show and tell! Always look forward to reading your great and insightful articles! Such great information. I love a good chair also! Thanks for the great information!